Dr. Elle (Alnaz) Fazlalizadeh graduated from the University of St. Thomas with a Bachelor’s degree in Biology. She then earned her doctorate of Optometry from the University of Houston, College of Optometry. During the course of her externships, Dr. Fazlalizadeh was trained in multi-disciplinary clinic settings, hospital settings, and surgery centers. While serving at Northeastern State University Surgical Clinic in Oklahoma, Dr. Fazlalizadeh preformed several laser procedures such as: selective laser trabeculoplasties, YAG-peripheral iridotomies, and YAG-capsulotomies. While serving at the Golden Eye Clinic in north east Texas, she was under intense optometric training with emphasis in primary care, pediatric care, glaucoma, ocular pathology, ocular trauma, cataract and refractive surgery co-management. Dr. Fazlalizadeh’s passion and devotion to the profession of optometry transcends beyond city limits. Her commitment to community service includes not only providing eye care within the local community, but to other countries on Mission trips as well. 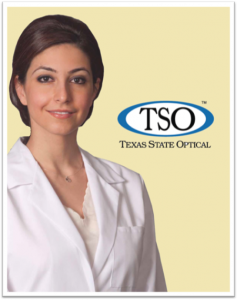 Dr. Fazlalizadeh is an active member of the Harris County Optometric Association, Texas Optometric Association, and American Optometric Association. She is also an active InfantSEE® provider. Outside of private practice, Dr. Fazlalizadeh also teaches as an adjunct clinical professor at the University of Houston College of Optometry.